With World War II over, and the Indianapolis Motor Speedway in the hands of the Hulman family, racing not only resumed around the globe, but at the Speedway during Memorial Day weekend. My father Purvis “P.D.” Jackson was a World War One fighter pilot whom met Eddie Rickenbacker during the war. So, it was Rickenbacker who spurred his interest in motor racing. My father originally owned the Continental Radio Tube business, but during the depression he lost everything; i.e. ; business, buildings & factories, etc. so he started over from scratch and began the Blue Crown Spark Plug Co. which was his first and only endeavor into sponsoring racing cars. Thus, with the resumption of racing at the Speedway that May, a lone Blue Crown Spark Plug Special (#8) was entered for Mauri Rose. 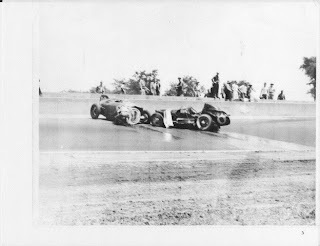 It was once again one of the Lencki Specials, as Mauri would be behind the controls of The original “Little Six” (Lencki 2V) that would ultimately see service at the Brickyard between the years of 1939 to 1948; with drivers Tony Willman, George Conner, Emil Andres, Mauri Rose, Ronnie Householder and Cletus Joseph "COWBOY" O'Rourke all taking turns behind the keyboard of this racecar which now resides in Nevada. 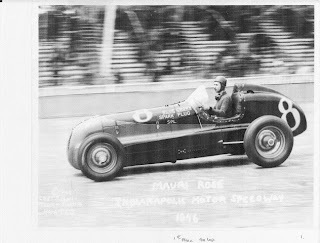 Ironically, the 1938 ex-Floyd Roberts winning chassis qualified on pole at the hands of Cliff Bergere, with a speed of 120.220mph. Since Lou Moore currently had no racing cars in his stable, he instead participated as Bergere’s chief mechanic, who had once again partnered with Moore. 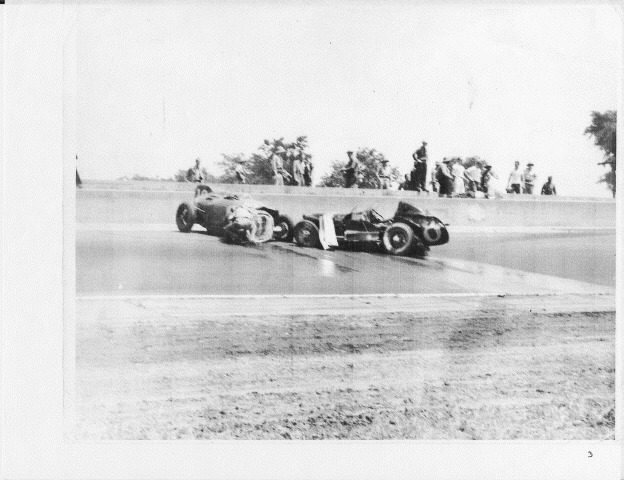 Yet, the sensation of qualifying was Ralph Hepburn, now 50 year’s old and piloting the newly constructed Frank Kurtis roadster with the ’41 Bud Winfield developed V-8, now renamed the Novi, with the race car carrying the moniker of Novi Governor Cup, while two most unorthodox racecar’s accompanied the pole sitter. The No. 8 Blue Crown Spark Plug car started ninth, on the inside of row three, driven by Mauri Rose and by the first lap led by a quarter of a lap, leading for 40 laps before it was involved in an accident, when Mauri spun out on an oil slick in the North chute and there was major carnage, with an axle being thrown 30-40 feet into the air! 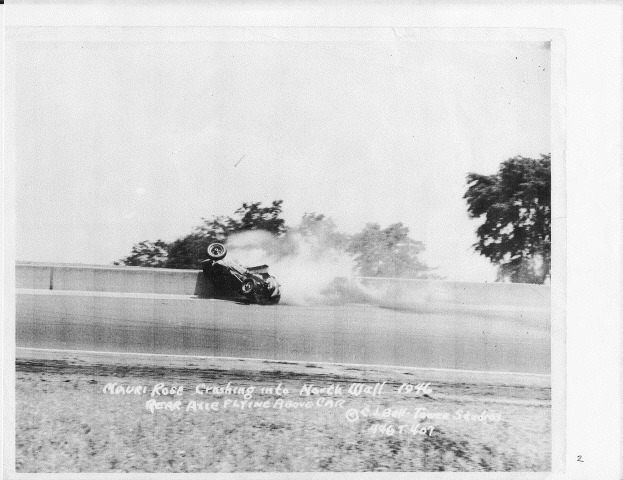 On lap 41, Rose rammed the stricken chassis of Paul Russo’s #10 Fageol Twin Coaches, which had crashed against the wall some 24 laps prior, but had been left unattended on the circuit! Thus, when Rose had been forced to take evasive action upon attempting to lap another competitor, whom seems to be unknown, a massive collision occurred and Rose would be classified 23rd. Interestingly, the Fageol Twin Coach was a rather unique vehicle entered by NOTED Indy Car owner Lou Fageol, whose fortunes seemingly came from his father who built twin engine busses for a living. Hence,, the motivating factor of the Fageol Twin Coach was based on the motor coaches principles and thus, not one but two 90cid four cylinder Offenhauser midget engines were shoehorned into the radical chassis with one each in front of and behind the driver. 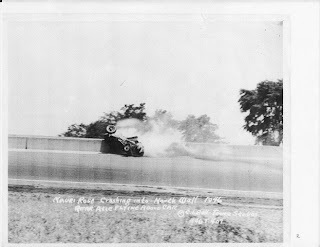 Meanwhile, rolling off from third place was a youthful Sam Hanks aboard another interesting creation, as the Myron Stevens 1939 chassis originally built for George Schroeder was motivated by the ex-Frank Lockhart V-16 Blackhawk Stutz supercharged engine. This sixteen cylinder Lump was the same motor propelling Lockhart’s fateful land speed record attempt on the sands of Daytona Beach in 1928, having originally been produced by the famed Miller Engine Works. 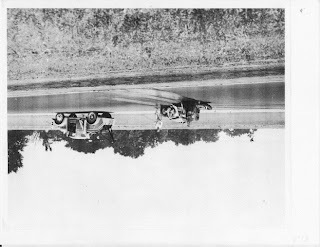 As the racecar was entered by popular bandleader Spike Jones and his Spike Jones special wound up finishing 31st, falling out with a broken oil line on lap 18.